The GLWB, along with the other regional boards, regulates the use of land in the Mackenzie Valley, with the exception of National Parks and National Historic Sites, which are administered by Parks Canada. Any persons who wishes to conduct an activity that triggers the thresholds outlined in the Regulations requires a Land Use Permit (see section 2.1). 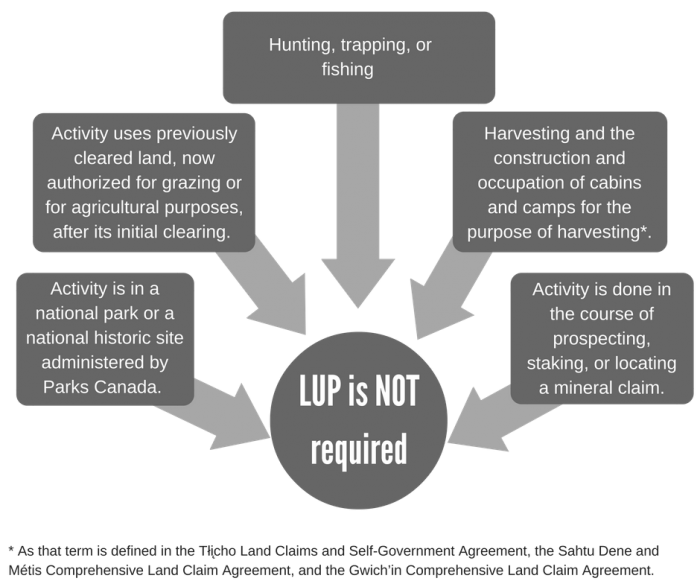 For example, holders of mineral claims, leases, right-of-ways, quarry permits, timber cutting permits, etc., will likely require a Land Use Permit (LUP) to undertake land use activities in relation to their interest. 1. Who owns the land for the proposed activity? 2. What activity is proposed? 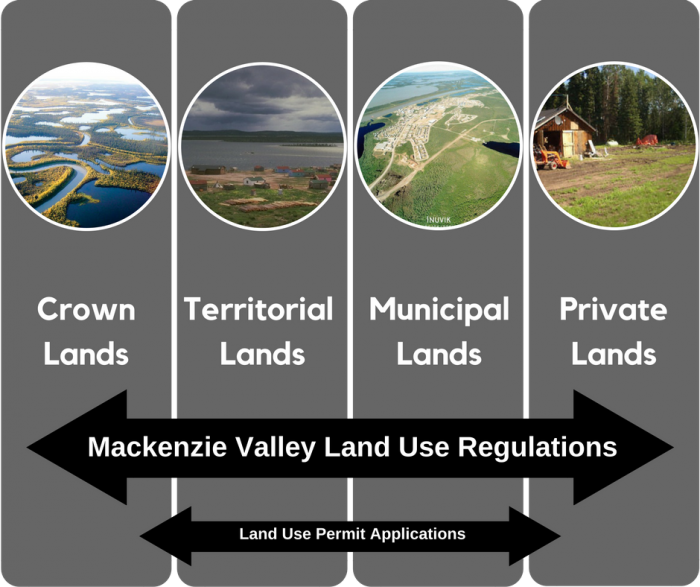 All lands within the Mackenzie Valley – Crown lands, territorial lands, municipal lands, and private lands – (except for Wood Buffalo National Park) are subject to the Mackenzie Valley Land Use Regulations (MVLUR). This means those lands are also subject to the application process for land use permits administered by the Land and Water Boards. If the activity is on Gwich’in private lands, the applicant must negotiate with Gwich’in Land Administration for right of entry and royalties. Applicants may also require authorizations from other federal, territorial, or Aboriginal government agencies or departments, depending on the type of land use activities being proposed. Applicants are responsible for obtaining a Letter of Intent from the appropriate landowner when the activity is within their boundaries. Use of more than 150 kilograms in any 30-day period. Use of more than 50 kilograms but less than 150 kilograms in any 30-day period. Use any vehicle or machine exceeding 10 tonnes net weight, other than on a road or on a community landfill, quarry site, or airport. Use of any vehicle weighing more than 5 tonnes but less than 10 tonnes net weight or exerting a pressure of more than 35 kilopascals (5 lbs psi), other than on a road or within a community landfill, quarry or airport. Use of any single container for the storage of fuel that has a capacity of more than 4,000 litres. The use of a self-propelled power-driven machine for moving earth or clearing land. The leveling, grading, cutting or snowplowing of any line, trail, or r-o-w, other than a road or existing access trail to a building, that exceeds 1.5 metres in width and 4 hectares in area. The leveling, grading, cutting or snowplowing of any line, trail, or r-o-w, other than a road or existing access trail to a building, that exceeds 1.5 metres in width but is less than 4 hectares in area. Construction of a building with a footprint of more than 100 m2 and a height of more than 5 meters. The use of power driven earth drilling equipment with an operating weight of more than 2.5 tonnes, (not including drill rods, bits, pumps, etc.) for a purpose other than the drilling of holes for building piles or utility poles or the setting of explosives within the boundaries of a local government. The use of power driven earth drilling equipment with an operating weight of more than 500 kg but less than 2.5 tonnes, (not including drill rods, bits, pumps, etc.) for a purpose other than the drilling of holes for building piles or utility poles or the setting of explosives within the boundaries of a local government. The use of a campsite outside a territorial park for a duration of, or exceeding, 400 person-days. The use of a campsite outside a territorial park for a duration of or exceeding 200 person-days but less than 400 person-days. If any of the above Activities require the use of equipment or material outlined in the table above, a LUP may be required. Take Note: When an emergency threatens life, property, or the environment, a person may carry out any land use operation as necessary to cope with the emergency. In this case, a written report describing the duration, nature, and extent of the operation must be submitted to the Board immediately after the land use operation is undertaken. Need a Land Use Permit? Apply using the GLWB Land Use Permit Application Form (fillable).